Bingham Town Council is proudly supporting the Bingham Royal British Legion and Bingham Heritage Trails Association with the WW1 Centenary Plans. A contribution was made to support sending two representatives to take the Bingham Standard to the Great Pilgrimage 90 at Ypres, Belgium from 5-9 August 2018. A decade after the end of WW1, veterans and war widows visited the battle fields of the Somme and Ypres before marching to the Menin Gate in Ypres on 8 August 1928. Exactly 90 years later, thousands of Legion members created the 1928 Great Pilgrimage to visit he same battle fields and the on 8 August 2018 carry their standards along the same route to the Menin Gate to commemorate the last 100 days of WW1 and represent an entire generation that served while defending their county. How is Bingham commemorating the Centenary of the end of World War One? 7:00pm: Methodist Centre; BHTA Memorial concert, Methodist Centre – “Looking Forward”, featuring Stormy Weather Boys, Vale Voices, Bingham School of Dance, Toot Hill School Big Band. 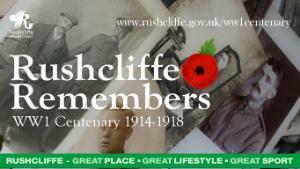 Rushcliffe Borough Council have compiled a list of events occurring across Rushcliffe on their Great War Centenary in Rushcliffe page. Events include a Ramblers Remembrance Walk and a Poppy Art Exhibition. Tickets are now available for the Games of Remembrance on Thursday 8 November. The Games of Remembrance, through the power of football, aims to bring World War 1 stories of courage and sacrifice alive, 100 years after the guns fell silent. Two football matches will be held on Thursday 8 November between the male and female British Army and the German Armed Forces which will include VIPs and sporting legends from both countries.